Digital cities concern metropolitan environments, where the ICT contribute to various local challenges and to the improvement of everyday life. These environments have evolved from usual broadband environments to mesh social spaces, which combine e-services, collaboration applications, crowd sourcing, and information and communications technology (ICT) infrastructures. Digital cities vary from web to smart ones and their implementation is based on particular strategic priorities. Today, most digital cities focus on ubiquitous computing and on Web 2.0 applications for the delivery of various e-services (e.g. e-tourism, e-security, e-health, and tele-care services) in the city area. In this context, digital cities are more likely to be considered as favorable environments for entrepreneurship and for social participation. However, a digital city is a complex and large-scale project; it demands viable analysis and planning in order to secure its sustainability and its adoption by the local community. In contrast to other ICT projects, managers have enough opportunities to revise and to transform their strategy, their plans, and their templates during its implementation. 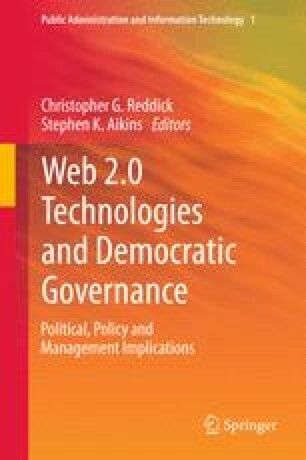 This chapter focuses on the economic and to the social considerations in the uses of Web 2.0 applications by Governments. It summarizes the most accepted forms of digital cities and their Web 2.0 applications. Moreover, it presents the most significant considerations for economic and social success of a digital city and it determines a viability model for such a project. The viability model contains qualitative decision factors and it is adaptive for different digital city cases.